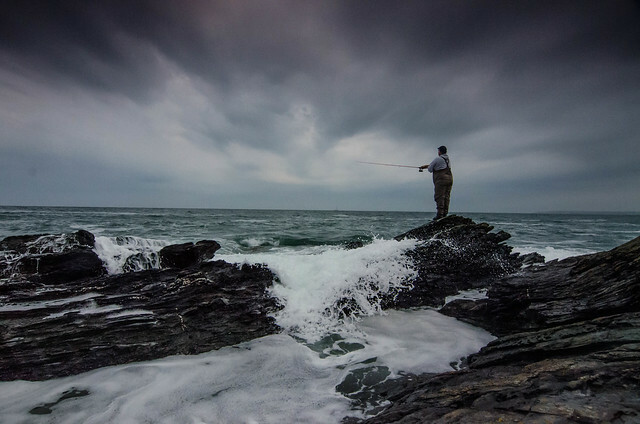 The Cornwall Lure festival was something I was really looking forward to this year. I was a bit slow to buying the tickets due to money constraints but finally got it done and it was game on. This year I did go a little mental and me and Tim decided to head down to Cornwall a couple days before to give us some time to try and find some fish before the comp started. 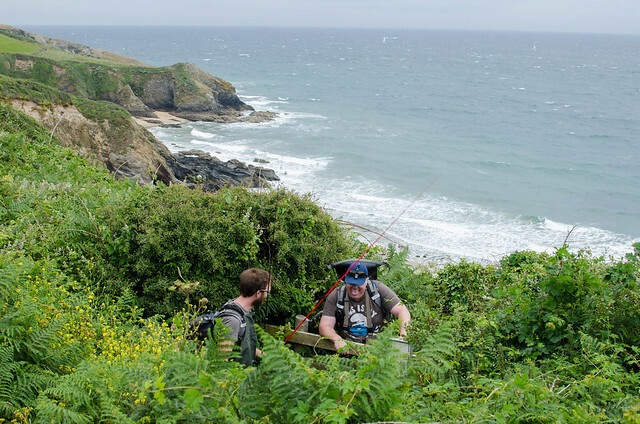 Cornwall is virtually untouched ground for us and for me there’s nothing more exciting than fishing somewhere new. 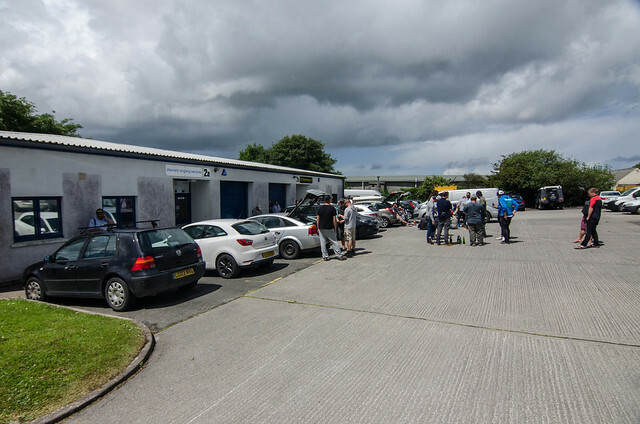 I had been studying google maps the week before looking for interesting ground to fish and looking at photos for accessibility but this is only a mere guideline and you can only really get a feel for a place once you’ve been there and seen it. 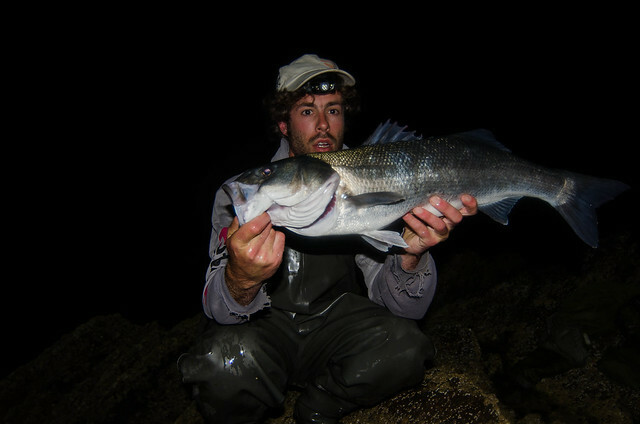 We had plans for any wind direction whether we went North or South coast but the night sessions looked like they might prove hard with a full moon and and spring low tides in the night. The weather leading up to the weekend looked good with a mixture of ESE and SSW winds. 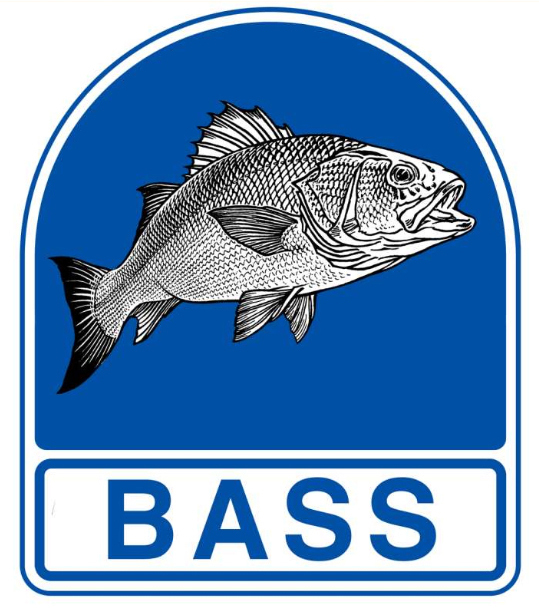 This lead us to fish the South coast and over some of the areas we favoured. We left straight from work on the Wednesday afternoon and stocked up on some food supplies and necessity’s along the way along with probably our last decent meal for a few days at a pub on the way. We arrived at the first mark around 8pm, it was a beach Tim had fished before but he had a certain place in mind he wanted to fish. We made our way along the beach. It looked too good for me not to have a chuck but it was littered with weed. Tim kept going and going and I eventually caught up with him along the rocks. One chuck for me and he was off again… I followed shortly after. As I approached him I could see he was into a fish but it was off as soon as I got there. What followed was some awesome action. Tim landed 6 fish upto 58cm and I only managed to land one but the action was non stop and there was some good fish smashing at our lures. I had 7 hits on one retrieve but couldn’t find anything to match the luring capabilites of Tim’s Sammy 100! The action slowly died as the tide dropped. We stayed on into the dark hoping that when the tide turned we might see a few more fish. The cloud cover came to shield us from the moon but the fish never came. About and hour up I had a good take on my Dolive shad but the weedless hook never hooked up and I missed the fish. After a few hours sleep we headed for a mark to fish over high water at first light. A long trek through fields finally got us onto the coastal path and we headed for the mark only to be greeted with super high cliffs and no obvious way down. It could well have been do able but it didn’t look great anyway with the water looking milky so it wasn’t worth the bother in hindsight so we left and headed to the next mark. Here we checked out an estuary that did look very tasty, had a few chucks and some food before heading off to scan more ground over low water on the coast. The plan here was merely to look for some good spots for us to potentially fish at night. No waders here today, beaming hot sunshine it was board shorts and sandels for me! 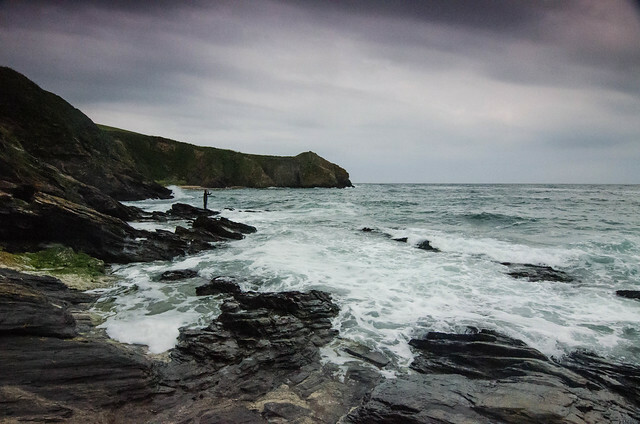 It looked a stunning piece of coastline but we didn’t feel confident in the daytime as the water was so clear even given the slight chop coming from the Southerly wind. We walked a good mile and a half and headed back down onto the rocks. The next little bay looked very good and instantly we both had a ”good” feeling. The swell was more straight in here and the water had a nice colour to it. Almost instantly Tim had a hit on his Savage gear sandeel rigged weedless. I was failing miserably as he pulled in a schoolie. I decided to get the camera out at this point and attempt some filming expecting a bit of action but it never really came. Though I did get Tim catching a couple fish. I managed to blank and only saw one fish appear from behind a rock and go for my lure before turning away. We didn’t hang around long as we wanted to head back for some food and a rest before getting back out for the evening high tide. This is where things went wrong, on returning to the car I came to the realisation that I had indeed lost my car keys. A quadruple check later and I could happily confirm this was the case. I thought this could be game over before it’s even began! Tim didn’t look to happy either but I wasn’t going to be beaten. We had a quick chat and thought there was to places it could be, we started walking but I didn’t want to waste time so I ran. Typically they where at the furthest point but I did find them! I met Tim halfway back and when we got to the cars it was decided to leave the spare key in the glove box from now on! After recharging with some tinned sausage and beans warmed up on the hob with a lovely crusty bit of french baguette from the local shop we where ready again! The next session was far from ideal. The wind had completely dropped from earlier and it was flat calm. We lobbed topwaters about and tried on the rocks at either end of the beach. We did pull a few small fish in but it was one of those sessions you really knew wasn’t going to happen. We couldn’t be bothered with a long move from here so stuck it out until the sun started to set and made a plan to fish an estuary in the dark as there was a spot I really liked the look of. Here comes fail number two! Access to the river was good from a car point of view and it wasn’t a long walk before we where on the shore. I headed out across the weed and Tim slowly followed. A few falls later (I’ve never walked on anything so slippery) and Tim was already getting pissed off. We made it to a pathway and stopped. He pointed out that the place I wanted to go was indeed a long way away. I managed to convince him to do it anyway. Back on the path we approached the mark only to realise there was clearly no way down to the shoreline! We decided to call it a night and get a good nights sleep before the festival as well as squeezing another early morning sesion in over high tide… At this point Tim realises he has also lost his car keys! Must have been when I fell over on the weed twice he says! He was to angry at the time he couldn’t remember where he had roughly fallen over! Brilliant! So 300yards of thick bublerack and small stringy weed later we actually managed to find his black car keys in the pitch black with just the help of our headtorches. What a day! I couldn’t believe it but we certainly had lady luck on our side at this point! After a good solid 5 hrs sleep, we headed out to try another mark before heading to the sign in at wadebridge for 12. The conditions really where stunning and the ground looked amazing. It had eveything but fish! Before going to the Art of fishing we stopped at the leisure centre for a freshen up! Wow, best shower ever? Certainly felt like it! Feeling refreshed it was off to the shop where we couldn’t help but empty our pockets of money, it was weighing us down along the rocks… We got a few lures for boat us, plus I picked up some stunning Megabass Renegade worm 4” and some Sakura Konieel 150 straight tails that look so much better than there paddletail brother. Ben had kindly given everyone in the comp a 20 percent discount over the weekend for competitors and we took full advantage! So many thanks for that Ben. We met Dave here as well and ended up being the last ones to sign in. The shop was empty by the time we got around to leaving. Tim took number 13 as it seemed everyone had left that one and I got 27, well I am 27… Got to be a good sign right? Duno, either way the numbers where drawn and it was off to the bassmobiles to get on our way. The weather had swung around Easterly hard now and we had to pick a mark to fish over low… Judging by how weedy most of the coast was over the previous days we opted for the big beach that was crystal clear the other night hoping that conditions would be spot on… Well they where sought of, but there was a hell a lot of weed and you just had to try and fish around it. We all saw fish and some good ones too but failed to connect with any of them in the tricky conditions. We had some food and renergized ourselves for the evening high tide. We headed back out a couple hours up to high tide to the same beach as we knew there was fish there. Thinking it should be easier to fish over the high tide and for me a more favourable time to fish it too. We started on the rocks and I was the only one to pull a small fish out but we all missed a couple. After an hour of that we moved onto the beach and started working that. Dave missed a take on weightless senko but me and Tim couldn’t get a sniff and I’ve never seen anywhere that looked so perfect as this. 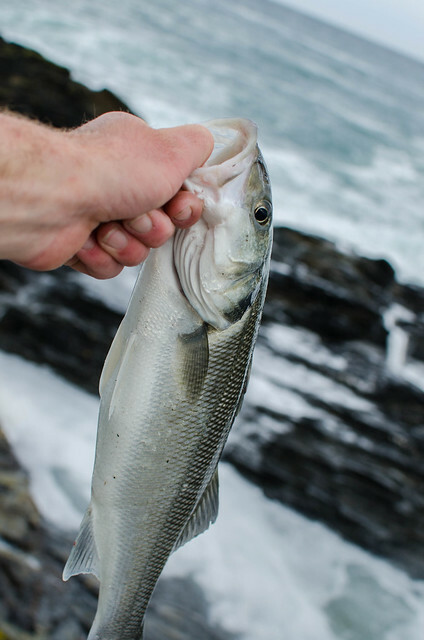 Knowing the ground we where fishing over, it’s geographical location, the current flowing along the beach and the conditions I was in awe we didn’t pull a few fish out let alone a good one! We tried everything possible and everything was possible to fish it really couldn’t have been more frustrating! Weightless lures, bounced shads, surface lures with rattles, poppers. 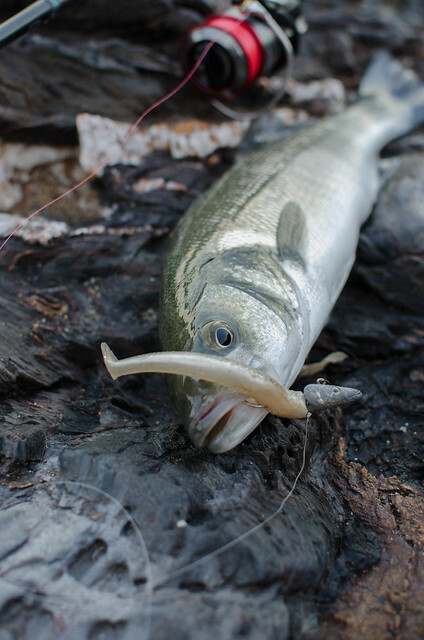 slow and fast subsurface lures. Bright/dark colours you name it we had thrown it… apart from metals mind! The night was drawing in and this really wasn’t happening. 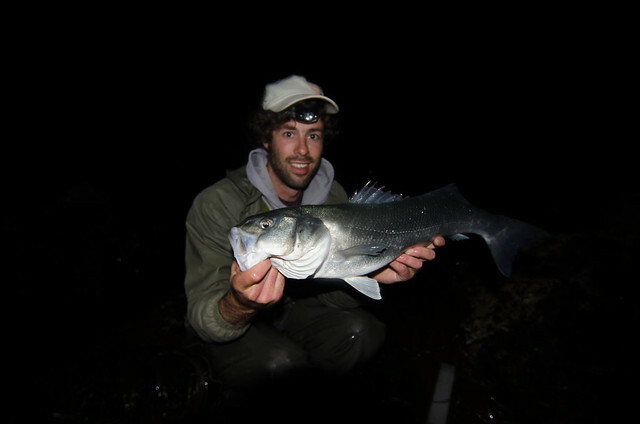 Fishing this in the dark as the tide dropped would have got difficult so we had to move on. Tonight was forecast as being overcast so we thought tonight would be our best chance of a night session if the full moon was covered. With the howling wind blowing all day a lot of the coast could have easily been blown out and we weren’t overally keen on trying the estuary any more so we had to gamble. 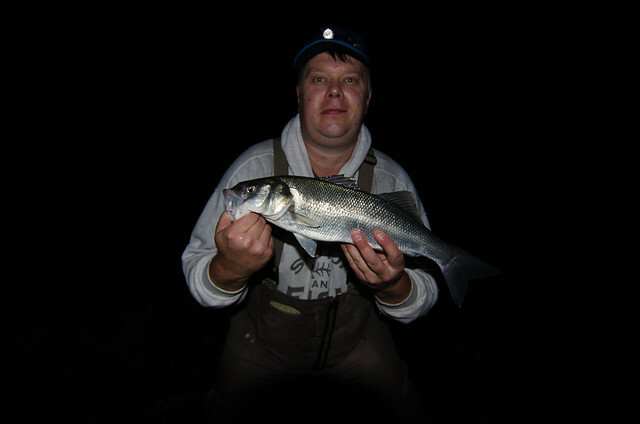 There where a couple of marks that I had thought looked ok and possible to fish at night over low, the wind wouldn’t be a problem and plus it was In the same area as where we had the fish on wednesday night so it made a pretty obvious choice. Having not seen these marks in the daylight approaching a new mark in the dark isn’t easy and you certainly have to keep your wits about you. Luckily there wasn’t much in the way of surf at the first mark and the tide was ebbing so nothing to really worry about. I climbed out onto some rocks that I knew put me in around some mixed ground. First cast and I got hit at range but no hook up. I could see waves breaking out in front of me so there must have been some reef. I cast around got snagged a few times and was trying to give myself a picture of the ground underwater but it wasn’t easy. Eventually I gave up and headed back to Tim who had reported getting in on some action. A 50cm ish fish and he lost a better one. Sounded good but only one more missed bite for me and that was it. Some bait anglers turned up and we decided on a move to the next mark certainly feeling more confident there was a few fish in the area. Tim landed the fish for me and it was a nice one too. 63cm, probably a pretty good fish to get in the festival. A 60+ is normally on the podium judging by the last few years so I was pretty pleased with that. I chilled out and the chaps kept going. At low water we decided to return to the car for a midnight snack before coming back to fish the rise in hope that the fishing would carry on. Walking back along the sand it was clear we where in the right place at the right time… Sandeels littered the beach. Big and small they where everywhere. We refuelled and headed back out. The tide had started pushing quick now and was in as far as when we started the session. Dave and Tim started fishing pretty early along the rocks but I went back to where I started. It must have only been 5 mins into the session when I got a bite and struck into a fish. The rod went double, line started smoking off my reel as the fish went straight out. Two or three really good runs ensued, infact the most powerful runs I’ve ever had. She was going for france alright. They weren’t that long though under my tight sticky drag but when I tried to get some line back she wasn’t really budging. That’s when I thought ”Yep this is definitely a good fish” I started shouting as I knew I could really do with some assistance trying to land this fish in this bloody minefield… The ground in front of me was hellish and I really did wonder if i’d even get to see the fish. Little gullies, and sharp barnacle covered rocks that where just covered as the tide came in, and I had to get her through it. No one came… WTF!? Oiii!!! BIG FIIIISH over here, heeeeelllppp. I was looking at them both just fishing away. They could definitely hear me. Meanwhile my rods bent over and shes off again. I’m just trying my best to keep her up near the surface for when it does get hairy close in. Tim finally comes bouncing over just as I manage to get her through a tiny gully to my right. She then ran parrell to the rock I was on. The head torch came on as me Tim looked down to see her just cruising along it below our feet. She certainly looked big in the water, a huge head and then as the body thins out they look seriously awesome from above like this. Tim grabbed the leader, a couple headshakes and not a minute of hesitation the only way to get her easily would be to slide her up and onto a small rock. The leader held and she was landed. Yep I was pretty buzzing at this point. Luckily there was quite a few rockpools around and I quickly unhooked her and got her in one to give myself more time to sort everything out. Ruler, stone, DSLR. Hopefully I set it up and working right? I’m still trying to get the hang of this thing properly and in the moment of trying to shoot a fish I have managed to get the setting’s wrong each time… I then decided I was going to try and film the release, with the SLR hanging round my neck and me cradling the fish I sketchily made my way across the rocks. Pressed record, got her moving in the water. She gave a few kicks, I aimed my head torch while looking through the camera. Let her go and watched her cruise off into the darkness. Awesome! Only to look at the camera and realise I had pressed record to many times and it didn’t actually record!! Shocking camera skills… We fished on but only one more schoolie followed. 4 hrs later and the towel over the back window had blown away leaving the sun to cook me! This isn’t what I needed. I had to sort it out before I could get back to sleep. I had just fallen out the boot when Dave pulls up in his car. He’d been to the shop to get some breakfast (lucky him!). We started chatting, I couldn’t be that rude but I wish I had. After a chat and a coffee that I couldn’t refuse I was awake… Tim got up an hour or so later. We didn’t have very much energy and decided to go for a proper meal before heading back out. Me and Tim headed back down to the previous mark over high in the evening to try into the darkness before heading back to the same mark the night before and meeting Dave and Blair. We didn’t have much luck though and only pulled in a couple more schoolies over the sessions. 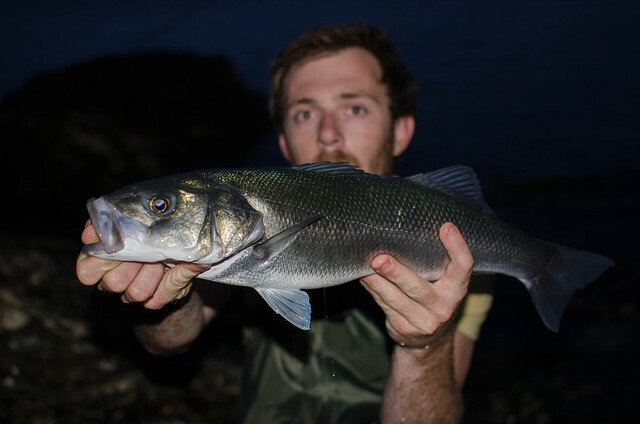 Whether it was the full moon that killed it the second night or we really did just get lucky the first time round because we didn’t see any sandeels the next night either so to me the fish had clearly moved on along with the bait. We still gave it a good go and fished right through the night till the sun came up. Exhausted we retired to bed to get some sleep before the presentation the next day. Somehow we managed to get to the presentation early even though we did wake up late. We started talking to some of the other anglers. We where talking to Craig and he asked us how we got on, I said we’d done alright and that I had landed a beauty at 70cm. I was feeling pretty smug at this point I’m not going to lie. So Craig how did you get on? I asked in return… Yeah not bad mate, I managed a 78cm… My face must have been a peach at this moment haha Fair play mate! What a cracking fish and to get it in the festival too is some going. We had a good long chat and he’s certainly got his marks sussed. 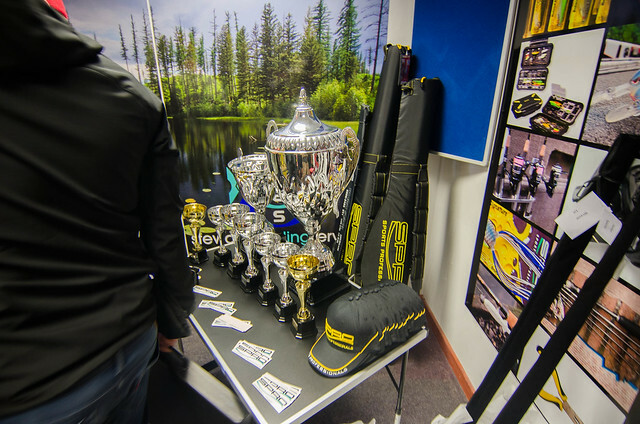 I was over the moon in the end to walk away with second place and my first ever trophy along with some tasty goodies supplied by Spro. Even had a cheeky win in the raffle too! Big thanks to Ben for putting it on again. We all really enjoyed the experience. For me it’s not about the winning even though that is a bonus but the adventure and challenge of fishing somewhere new is what really gets me going. We had a barrel of laughs as always and the banter didn’t end even when the fishing did. 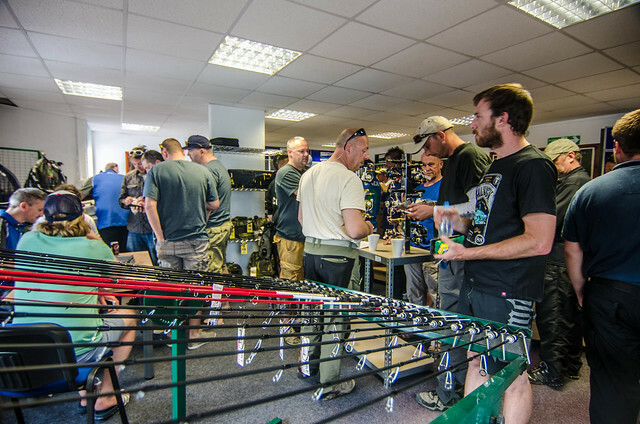 It was great to meet some new and old faces, Craig Russell, Mark Q, Mike oles, Jake Schogler, Robin Bradley, Ade, Kev Coleman, Iain mortimer, Rod and Clarkey to name a few. Can’t wait to do it again next year, it was EPIC! Got to say a huge thanks to Tim and Dave too, couldn’t have done it with out you lads! This entry was posted in The Fishing and tagged Art of Fishing, Bass, CLF, Cornish Lure Festival, Cornwall, Lure fishing, Savage gear Sandeel, Senko. Bookmark the permalink. ← It’s coming together nicely! Nice blog keir great effort and lucky ain’t the word on those keys! Fantastic report Keir, very well done. One helluva report Keir ! Hats off to you guys for a monumental effort. Inspired me to give it a go next year. Might have to put some yards in beforehand though to get to know it just a bit ! From what everybody is experiencing at the moment it seems that night sessions seem to be producing the goods. Just back from the festival in Ireland which was tough to say the least but Blair will know doubt fill you in. Put it this way , glad to be back on the Hams ! Thanks Andy, have heard it was tough going over there for everyone which is a shame. The conditions can screw you in many ways. Hopefully meet up with you on the rocks soon!